NARRATOR: Kimberly Dodge was born hearing and grew up in a small Midwestern town in Michigan. When she began kindergarten, a hearing loss was detected, and by the time she was eight, she was completely deaf. Kim was mainstreamed in elementary school and high school and later graduated from Michigan State University. Looking back, Kim realizes that it was her own independent spirit and persistence that enabled her to take charge of her situation and enlist the support of family, friends, and teachers to help her succeed in school. By the time she was in eighth grade, she knew that she wanted to work with animals. She thought it would be interesting to combine her love of medicine and animals by becoming a veterinarian. Now Dr. Kimberly Dodge, Emergency Veterinarian, works at the Connecticut Veterinary Center in West Hartford, Connecticut. Although she's miles away from her Midwestern upbringing, the can do spirit instilled in her as a young girl is very much alive. INTERPRETER: I went with my parents to the vet with our cat one day. And that's where I got the idea that doctors can work with animals too. I liked that better. And I thought, wow, I really could enjoy doing medicine and work with animals. And I thought that was a cool option. OK, she looks very healthy now. She looks very good. What I'm going to do is to send home some medication home with you. Give her one time a month, OK? And if she's negative you can go ahead and start giving it to her. All right, do you have any questions? You have to be able to deal with people well, or you need to improve your people skills. I'm working on that now. And you have to be willing to work hard. It's a lot of work, but I think it's a lot of fun too. There's a lot of rewards. But I've gotten very positive feedback from my deaf clients saying that it's easy for them to communicate with me. Therefore, they ask even more questions because they'll understand the explanations. Clients are actually in awe at how much she can present as a doctor. And she has a good rapport with clients. They love her. And they love her because of her thoroughness. They love her because of her knowledge of veterinary medicine. And her communication with the client is not hindered because she is deaf. She likes emergencies. I think she prefers emergencies, which are higher anxiety. She really likes the stimulation of many new things presenting on different nights and being able to assess and deal with very different problems. She's very good at it. INTERPRETER: During surgery, we've taught the staff to work a little bit more with their hands, to gesture more. Because obviously, with masks on during surgery, you can't communicate like we talk normally. She has earned respect, big respect around here. And her medical skills, her surgical skills, they're impeccable. And you just think of all the extra work that she has had to do to come where she is, and you just can't help but respect. And she's earned it, and we give it to her, I give it to her. She gives it back though. INTERPRETER: I have a stethoscope right now that has a visual display on it, and you can see a line following the rhythm of the heart, which is OK. One of the problems with that is doctors can tell their clients to hold their breath and release it but a dog is always panting, and it ruins, really ruins the wave. I can put my hand on the animal's body and can sense sound and the different sounds between the lung, the heart, and the abdomen. I pay attention quite a bit to how the animals behave and what they're doing. There's always something going on and you don't know what's going to be coming in the door next. You don't know the background of the animal, and you don't know what happened. You just have to figure it out right now. And to figure it out, you have to help the animal and explain it to the owner. And I like that challenge. I became a person who does surgery here, because what other job can you come to work, wear your pajamas, play with puppies and kittens all day, and get somebody else to clean up the mess? INTERPRETER: You should not let people tell you you can't. People don't know. There are so many people who told me you can't do this and you can't do that. And they didn't know. Find other ways to do it. Just because nobody knows a way to do it, doesn't mean that there's not a way to do it. That's a different thing. And if you're willing to be flexible, and if you're willing to learn, and if you're willing to explore a little bit, then encounter a lot of frustrations, I think at the end it's worth it. I like where I am today, and I enjoy my job. I enjoy what I'm doing, and I don't regret any of it. Dr. Kimberly Dodge became deaf at the age of eight. She knew she wanted to work with animals by the time she was in eighth grade. 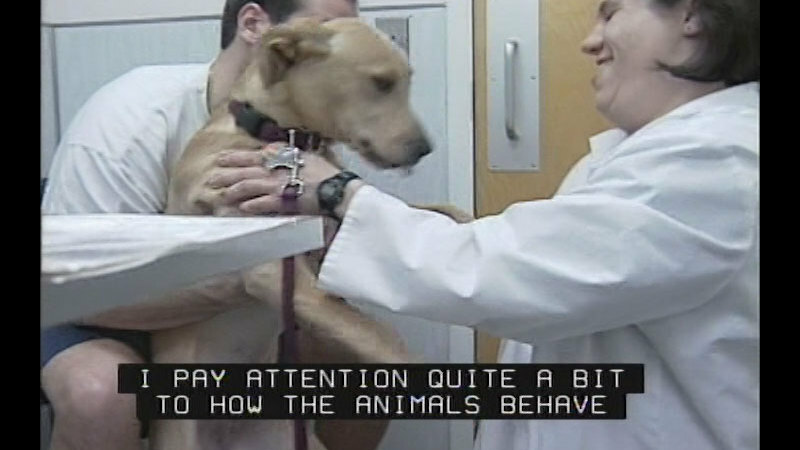 Today she is an emergency veterinarian at the Connecticut Veterinary Center. This is a short segment from the "Achieving Goals! 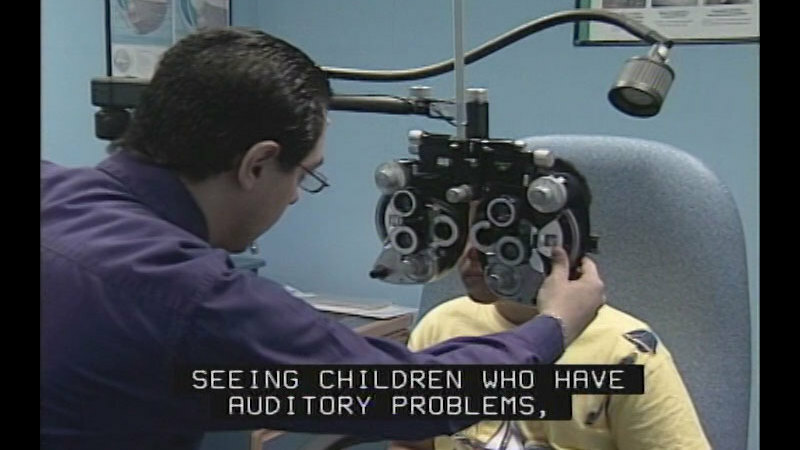 Career Stories of Individuals Who Are Deaf and Hard of Hearing: Phenomenal Professionals."